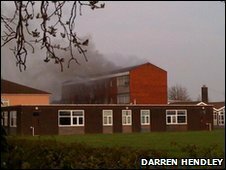 A Lincolnshire school is expected to reopen on Wednesday after a fire which caused considerable damage. Crews were called to Cherry Willingham Community School in Croft Lane, near Lincoln, on Friday evening after smoke was seen coming from the building. There were no reports of any injuries, but there are concerns about GCSE coursework being damaged. A spokeswoman for Lincolnshire Fire and Rescue said the school has considerable smoke damage. Head teacher Edward Fitzpatrick said: "The alarms went off... a number of school staff were still on the site at that time so we evacuated the building. "There is likely to be some students' work in there because they're teaching rooms but we can't really comment at the moment as teachers may have taken it home to mark. "We've got a lot of upset staff and a lot of upset pupils worried about their coursework."